I’m pretty excited to release this video! A couple years ago I made a video on how to grow your own soybean sprouts, and since then I’ve been experimenting with growing my own mung bean sprouts. Korean cuisine uses mung bean and soybean sprouts in many dishes (like this mung bean sprout side dish). I love their crispy texture. Now that I grow them at home I eat them a lot more often, and they are also cheaper and more delicious than what I can buy in a store! They are pretty simple to grow, but you need patience and you need to be sure to water them often, or else they won’t grow long, plump and crispy, they’ll be thin and stringy. Also, be sure to keep them out of the light, so they grow yellow, not green. I used an old black t-shirt over top of my planter to keep them dark. As I mentioned in the video, I have strong memories of my grandmother growing soybean sprouts when I was young. I used to be woken up by the sounds of her dripping and trickling water over the sprouts at all hours of the night. She had them in a corner in the room where we slept. She used to make a huge amount in a large basin, with a wooden platform across it, on top of which she grew the beans in a traditional Korean siru (시루), an earthenware pot with holes in the bottom used for steaming rice cakes. She was always watering her beans by scooping some water from the basin over top of them. Over time, the sprouts grew owing to my grandmother’s care. It made a real impression on me. It’s a one-week commitment but it gives me a lot of happiness. When I think about my grandmother, I’m sure she must have felt the same way as I do. Pick out any broken or blemished beans. Wash and drain and soak the beans in cold water for 24 hours. The next day, place the mesh net on the bottom of the planter and add a paper towel over it. Drain the beans and put them into the planter on the paper towel. Wet the beans with cold running water one last time. Put the small bowl upside down in the large basin. Put the planter on top of the small bowl, so the water will drain out nicely into the basin, and the planter won’t sit in the water. Cover it with the black cloth. Water the beans as often as you can, at least every 3 hours. It’s ok not to water them all night, but if you happen to wake up you can water them. Otherwise, be sure to water them first thing in the morning. On the 3rd day, the beans will start sprouting. On the 5th day, the sprouts will grow 2 to 3 inches long. The 6th day should be harvest day. You’ll get 5 pounds of bean sprouts. Put them into plastic bags and keep them in the fridge. You can store the sprouts for up to 7 days, longer than that and they may brown and wither. Posted on Friday, October 9th, 2015 at 7:29 pm. Last updated on October 19, 2015. Posted December 30th, 2018 at 6:26 pm | Log in to reply. I am currently residing in Jesup, Georgia USA. I’ve been attempting to purchase bean sprouts here without success. In order to alleviate my frustration I decided to grow my own. Thank you for the useful Expert advice. is way more than I can use so I modified, by reducing,your amount of seeds, size of the container, and color of the cloth. The color was simply because I did not have a black cloth handy and assumed the important part was to block light. Once again my thanks and appreciation. Posted December 30th, 2018 at 6:35 pm | Log in to reply. I could not edit to repair what went wrong in the delivery so I’ll correct it here. Somehow the reduced amount also disappeared I reduced the amount from 1 and 1’2 cups to 1/2 cup. I was unable to post the second photo with my red cloth so here it is. Posted May 3rd, 2018 at 5:25 pm | Log in to reply. Maangchi, Unni!!! Look at my sukju-namol! Every time i open the black cover on my planter I get very excited. It is just so amazing to see how much it’s multiplied. I only had a cup of mung beans in the cupboard but even then i had a great harvest. Thank you so much for sharing how to grow our own bean sprouts. I also love kungnamol but i still have to find soybeans here in Sicily. I miss all the food back in Korea but now with your videos I can make my own but not all since some ingredients are not available in our island. Kamsahamnida, Maangchi! Posted April 5th, 2017 at 3:01 pm | Log in to reply. First time trying your recipe and first time poster here. My sprouts look okay except for a little purple due to light exposure (sunny window where I watered them”. But I’m afraid to use them because some of the mung beans have brown spots on them. I put a few at the top of the pile in the picture . It seem to occur most with those at the top of my planter bucket. So I discarded those. Do I need to the discard everything? Is it mold or rot? Do you know how I can avoid that in the future and get the lemony yellow colored sprouts like yours ? I did place the planter next to a heating floorboard. It wasn’t hot by any means but it was the warmer area of the house . Dumont beans prefer to be cooler … like near a window ( I live in Boston so right now the windows are cool ). Posted April 5th, 2017 at 3:02 pm | Log in to reply. Sorry for the typo : *Do you mung beans prefer to be cooler? Posted April 6th, 2017 at 5:28 pm | Log in to reply. Posted April 9th, 2017 at 10:42 am | Log in to reply. Follow the directions closely and don’t put the planter in a warm spot. And also check out the beans to make sure they are not too old. That’s all I can think of right now. I hope this is helpful to anyone else considering a warmer place. Nothing definitive; consider it a ‘?” at this point. I will report back after I try again. Posted January 3rd, 2017 at 11:57 pm | Log in to reply. Posted January 3rd, 2017 at 11:56 pm | Log in to reply. Hi Maangchi – Mine turned out purple. Does that mean the sprouts were exposed to sunlight? Do you think that affects the taste. The roots also seem really long. Did I wait too long to harvest? Should I discard and start a new batch? Posted January 5th, 2017 at 2:23 am | Log in to reply. Yes, they look a little overgrown but you still can eat them. Regarding purple color, it happens when the beans are exposed to light. Posted December 31st, 2016 at 12:06 am | Log in to reply. Hi – If I am unable to water at night, can I just leave a wet paper towel on top of the beans. Will that cause mold? Posted September 6th, 2016 at 4:18 pm | Log in to reply. I gave it a try and after 5 days I was giving it to every body. My thai friends were more than happy to have them. My spanish mother-in-law is now saying big NO to the canned mung bean sprouts. She has been even trying it in her own spanish recipes. Thanks to you maangchi. Posted April 30th, 2016 at 2:11 pm | Log in to reply. Posted April 23rd, 2016 at 10:44 am | Log in to reply. Posted April 24th, 2016 at 8:37 pm | Log in to reply. Your bean sprouts look wonderfully well grown! Posted November 9th, 2015 at 1:13 pm | Log in to reply. Does it matter where you buy the beans? I bought a pack at the grocery store, pretty cheap. Does it affect the quality of the sprouts? There’s websites that sell beans and seeds, but why pay if it’s not necessary, right? Posted October 26th, 2015 at 11:49 am | Log in to reply. Posted October 26th, 2015 at 4:23 pm | Log in to reply. yeah, plump plump! Did you cut off the roots? 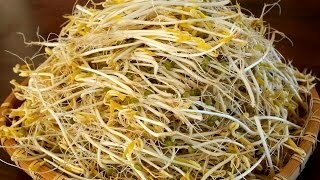 I’m planning to post a blog about my readers’ homegrown bean sprouts. Posted October 27th, 2015 at 8:22 am | Log in to reply. Posted October 18th, 2015 at 7:57 pm | Log in to reply. What can I use if I don’t have a mesh net? Posted March 28th, 2016 at 12:44 am | Log in to reply. Posted October 12th, 2015 at 4:57 am | Log in to reply. Posted October 12th, 2015 at 11:28 am | Log in to reply. Posted October 20th, 2015 at 12:25 pm | Log in to reply. 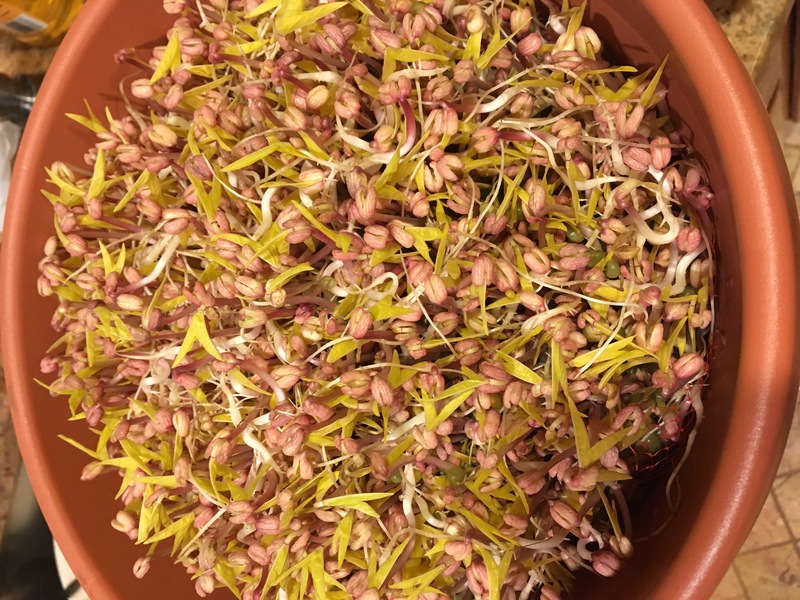 I’ve harvested my mung bean sprouts at Day 5. The pot I took was too little hehe, next time I am going to correct my mistakes. And the TASTE?! OMG! so fresh and yummy. Posted October 20th, 2015 at 12:52 pm | Log in to reply. Gorgeous! It looks like a bouquet of flowers! Posted October 10th, 2015 at 3:58 am | Log in to reply. Kamsahammida, you’ve solved my problem. Posted October 9th, 2015 at 10:08 pm | Log in to reply. Posted October 12th, 2015 at 11:31 am | Log in to reply. If you grow them, take a photo and show them to me, please. This recipe was originally posted on October 9, 2015 at 7:29 pm by Maangchi. It was last updated on October 19, 2015. The video was watched 1,533,576 times on YouTube & has 25,744 likes!